The Corvette has been going strong for about 60 years. 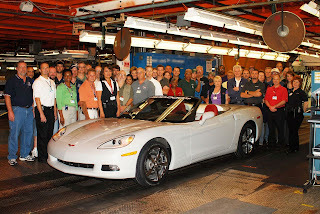 Recently, Chevrolet produced the 1,500,000th Corvette at GM Bowling Green assembly plant. The announcement of this incredible milestone was made by Karen Rafferty, Chevrolet Product Marketing Director. "The 1.5 millionth Corvette is a great example of how Chevy is America's brand" Rafferty said at a meeting of the Greater Atlanta Automotive Media Association. "For nearly 60 years we have built America's Sports Car and this milestone is a solid proof point." The car in question is a white Convertible 3LT that has a red interior and a black top. Incidentally the first, 500,000th and 1 millionth Corvettes built in 1953, 1977 and 1992 respectively had similar features. The Corvette executive also took the time to announce that the new 2010 Corvette Grand Sport coupe will be priced at $55,720 while the convertible will be $59,530. Included in the prices is a $950 destination freight charge. Rafferty went on to wax lyrical about the Grand Sport, noting that it has a 0 - 60mph sprint time of less than 4 seconds. Motorway fuel economy is claimed at 26mpg.